Bangladesh Foreign Minister Dipu Moni on Tuesday sought the Kingdom's support for her country's bid to become a nonpermanent member of UN Security Council from 2016 to 2017. Moni, who is on an official visit to the Kingdom, made this request during her meeting with Foreign Minister Prince Saud Al-Faisal in Jeddah on Tuesday. “Saudi Arabia has stood with us on all international platforms and we are positive that it will give its support for the country's proposed new role in the UN Security Council,” Moni told Arab News following talks with Prince Saud. The visiting minister said the entire gamut of bilateral relations was discussed at the meeting. “We expressed our common views and concerns on many regional and global issues,” she said, adding that changes could take place through peaceful means and not violent methods. During the discussions, the visiting minister also expressed her gratitude to her counterpart for employing about 1.5 million Bangladeshi professionals and workers in public and private sector organizations in the Kingdom. 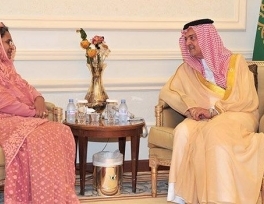 She requested Prince Saud to urge Saudi businessmen to employ more Bangladeshis. She also requested the prince to resolve problems concerning her country’s workforce in the Kingdom, including transfer of their iqamas (work permits) and allowing male children over 18 to stay in the Kingdom with their parents for educational purposes. Prince Saud expressed satisfaction on the contribution of Bangladeshi workers to the Kingdom’s development and mentioned the Saudi people generally liked them as they were hard working, well disciplined, law-abiding, pious and loyal to their employers. The prince said he would refer problems faced by Bangladeshi expatriates to the Labor Ministry and other concerned governmental bodies. 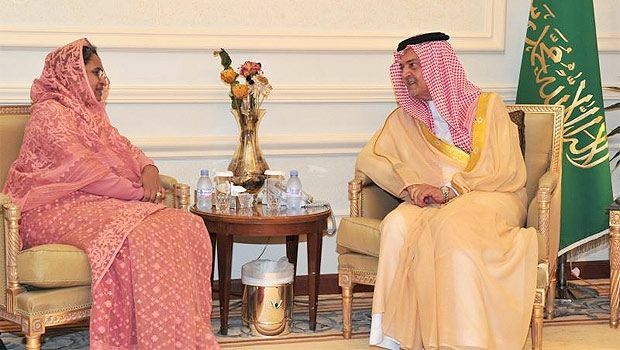 Appreciating the Bangladeshi government’s recent reforms under the leadership of Prime Minister Hasina Wajed, Prince Saud said the Kingdom would provide necessary support to help the country forge ahead. The foreign minister said the Saudi Fund for Development would continue supporting Bangladesh in its bid to become a middle-income country. Prince Saud said that he would persuade Saudi businessmen to take advantage of the investment opportunities in Bangladesh after a request by Moni. Bangladesh manufactures high quality export products such as ready-made garments, leather and related products, ceramics and pharmaceuticals. State Minister of Home Affairs Shamsul Haque Tuku, Bangladesh Ambassador Mohammed Shahidul Islam and senior officials from both sides were present at the meeting. Earlier in the day, Moni and Tuku inaugurated the machine readable passport and visa programs at the Bangladesh Consulate General in Jeddah. The function was attended by a large number of Bangladeshis.